The planet is experiencing a “movement of peoples” unseen in decades, if not centuries. The UN recently (20 June) observed World Refugee Day in recognition of this problem. People are fleeing oppressive regimes, climate change induced droughts, floods and loss of land, wars and other forms of what the United Nations calls “drivers of emigration.” Although Europe and North America receive the greatest amount of media attention regarding the problems they face as new people try to enter, their migration problems are dwarfed by countries such as Jordan and Lebanon where refugees form up to 20 percent of the overall population. For comparison, 20 percent of the population of the U.S. would be 66 million people! CNEWA has been in the middle of this movement of peoples — helping refugees, internally displaced people and those suffering from war and persecution in the Middle East, the Horn of Africa and India. We have helped people in refugee camps obtain what they needed to get through winters, in addition to providing health, social and educational services. It is important to note that this movement of peoples involves many types of people, leaving their homes for many different reasons and under a variety of circumstances. There is often confusion in terms when speaking of refugees, asylum seekers, immigrants, etc. Terms often have a specific, legal meaning. Putting all groupings together, the UN speaks of “populations of concern” and “forcibly displaced people.” The terminology and legal structure is, however, evolving. And the distinctions are important. The UN estimates there are 68.6 million people in the world who have been forcibly displaced. Of these, 40 million are internally displaced people, who have been driven out of their homes and forced to live in other places in their home country. For example, many Christians in Iraq were forced to leave Baghdad for the Nineveh Plain and then driven from there to Iraqi Kurdistan. In Syria large numbers of people—Christian and Muslim—have been driven from their homes to live in other parts of the country. The internally displaced are, however, only part of the present crisis. Millions of people are leaving their native countries entirely. And the numbers are overwhelming. It is estimated that, legally speaking in terms of international law, there are 25.4 million refugees, 3.1million asylum seekers and 10 million stateless people in the world. The problem is unprecedented and is putting tremendous economic, cultural and political pressure on target countries throughout the world. Although countries in Europe and North America are often loudest in bemoaning the crisis, the top refugee hosting countries in the world according to the UN are Turkey (3.5 million), Lebanon (1 million), Pakistan and Uganda (with 1.4 million each) and Iran (979,000). In countries such as Lebanon and Jordan, the refugee population is so large — up to one fifth of the people— it can cause incredible— indeed existential—economic, social and political problems. But it’s important to note that the UN differentiates between refugees, migrants, stateless persons and asylum seekers. Let’s look how the United Nations defines these terms. Finally, while asylum seekers form a distinct category, their legal rights are not clearly delineated. The UN Universal Declaration of Human Rights (1948) holds that “Everyone has the right to leave any country, including his own, and to return to his country.” And “everyone has the right to seek and to enjoy in other countries asylum from persecution.” However, it is not worked out what limitations sovereign states may impose on these rights, since the UN clearly recognizes that sovereign states have control of their borders. An initial attempt at dealing with migration is the UN Global Compact on Migration (2017), which attempts to deal with the complexity of the problem. Archbishop Bernadito Auza, the Permanent Observer (Ambassador) of the Holy See to the UN, has been very active in developing and promoting the Global Compact on Migration. Pope Francis and his representative at the UN have been advocates and voices of justice and compassion for the millions of people displaced by violence all over the world. Recent discussions at the UN recognize that these people are forcibly displaced, i.e. the do not want to leave their homes. There is an emerging notion of “the right to remain,” that recognizes that the “drivers of emigration”—war/violence, poverty, persecution of minorities, climate induced changes such as droughts, disappearing island nations, etc., need to be addressed in a just and equitable way, if the problems of the contemporary movement of peoples is to be alleviated. Moreover, there is a growing recognition that people have a basic right to demand that governments do everything possible to remove the drivers of emigration which are causing the global problem. And the Church, in part through the work of CNEWA, is seeking to bring compassion and hope to many of these people on the move. Defending the weak or hopeless and becoming a servant to those most in need is the best promotion one can ever receive, Pope Francis told new and old cardinals. “None of us must feel ‘superior’ to anyone. None of us should look down at others from above. The only time we can look at a person in this way is when we are helping them to stand up,” he said during a ceremony in which he elevated 14 bishops and archbishops from 11 different nations to the College of Cardinals on 28 June. The formal ceremony in St. Peter’s Basilica began with Pope Francis, wearing a miter and carrying a pastoral staff of retired Pope Benedict XVI, leading a procession of the soon-to-be cardinals -- in their new red robes -- while the choirs sang, “Tu es Petrus” (You are Peter). The 69-year-old patriarch, whose country has lost an estimated 1 million of what had been 1.5 million Christians over the years of war, violence by extremist militants and economic insecurity, thanked the pope for his special attention to the plight and struggle of “the tiny flock” of Christians throughout the Middle East. “We pray and hope that your efforts to promote peace will change the hearts of men and women for the better” and help the world become a more “dignified” place for all people, the patriarch said. Being made a cardinal, he noted, was not a prize or a personal honor, but an invitation to live out one’s mission more firmly dedicated to “the very end,” even to give one’s life, as symbolized by the cardinal’s color of red. Their mission, the pope said in his homily, is to remember to stay focused on Christ, who always ministered and led the way, unperturbed by his disciples’ infighting, jealousies, failings and compromises. Personal conversion and church reform are always missionary, he said, which demands that looking out for and protecting one’s own interests be stopped, so that looking out for and protecting what God cares about remains at the fore. Pope Francis then read the formula of creation and the names of all 14 cardinals; each new cardinal recited the creed and took an oath of fidelity to Pope Francis and his successors. One by one, each cardinal went up to the pope and knelt before him. The pope gave them each a cardinal’s ring, a red skullcap and a three-cornered red hat. The assembly applauded for each new cardinal as the pope stood and embraced each one, in some cases, speaking to them briefly and privately. With the new members, the College of Cardinals numbered 226, with 125 of them being cardinal electors -- those under 80 and eligible to vote in a conclave. With this consistory, Pope Francis has created almost half of the voting cardinals. The new cardinals are from Iraq, Spain, Italy, Poland, Pakistan, Portugal, Peru, Madagascar, Japan, Mexico and Bolivia. The current College of Cardinals now represents six continents and 88 countries. -- Luis Ladaria, 74, prefect of the Congregation for the Doctrine of the Faith. -- Angelo De Donatis, 64, papal vicar for the Diocese of Rome. -- Giovanni Angelo Becciu, 70, substitute secretary of state, prefect-designate of the Congregation for Saints’ Causes. -- Konrad Krajewski, 54, papal almoner. -- Joseph Coutts of Karachi, Pakistan, 72. -- Antonio dos Santos Marto of Leiria-Fatima, Portugal, 71. -- Pedro Barreto of Huancayo, Peru, 74. -- Desire Tsarahazana of Toamasina, Madagascar, 64. -- Giuseppe Petrocchi of L’Aquila, Italy, 69. -- Thomas Aquinas Manyo Maeda of Osaka, Japan, 69. -- Sergio Obeso Rivera, retired archbishop of Xalapa, Mexico, 86. -- Toribio Ticona Porco, retired bishop of Corocoro, Bolivia, 81. -- Aquilino Bocos Merino, 80, former superior general of the Claretian religious order. With the summer months bringing warmer weather, we were reminded recently of how some of those we serve struggle to survive the coldest of winters—and how CNEWA’s donors are making a dramatic difference in their lives. With this project we could assist the most vulnerable families ( 630 families, about 2,800 people) through paying their gas or electric bills; urgent provision of firewood to families who cannot afford electric or gas heating; provision of medication to sick people; emergency assistance in basic food and hygienic items for the most vulnerable families living in temporary shelters. Arevhat Oustjan was born in 1935 in Kirovakan. She was 20 years old when she married and moved to Russia with her husband. They were happy together but they didn’t have children. She was only 39 when her husband died. And she again moved to her native town after that. For 44 years, she has lived alone in her one room apartment. She grew old and developed a number of illnesses that don’t permit her to go outdoors. She has poor eyesight and her limbs are aching and swollen. Her meager pension and welfare amount to just over $100 a month jointly. But she has many financial obligations. Her niece was battling breast cancer and she had taken a loan from the bank for the operation. Sadly, her niece died, but Arevhat must continue to pay off the debt and very little remains for her daily bread. She is so thankful to the project that supports her to make ends meet. She relies only on Caritas’ support for her daily living. The windows of the apartment are in poor condition, and the wind blows through them. Arevhat has to cover them with cotton cloths to keep the house warm. It was never enough. But the Warm Winter Project is now to heat her house. “Never mind that I can’t buy new windows,” she said. ”The main thing is that I don’t need to pay for heating. It’s a great help for me. The frosty and horrible winter is already in the past; I do not even want to remember the situation I had endured before. I was always jealous of the elderly who lived in warm houses in winter time, surrounded by the warmth and companionship of their children and their relatives. I am quite alone and I don’t have any of them. Now I have at least a warm apartment, for which I am very grateful to Caritas and the supporters who treat us with all their care,” she said. Thank you to all who are making it possible for us to spread light and warmth to so many like Arevhat who have known only darkness and cold. 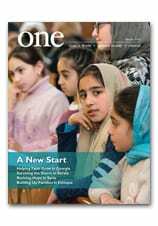 To learn more about CNEWA’s efforts to help the elderly and poor in Armenia, read ‘This Is the Only Light’ in the June 2017 edition of ONE. King Abdullah II of Jordan has been chosen as the 2018 Templeton Prize Laureate. He has “done more to seek religious harmony within Islam and between Islam and other religions than any other living political leader,” said a 27 June announcement on the award released by the John Templeton Foundation in West Conshohocken. King Abdullah will be formally awarded the Templeton Prize at a ceremony in Washington on 13 November. The price has a monetary value of about $1.45 million. Jordan’s leader was recognized for his work to promote a peaceful Islam and bring an end to religious violence in the Middle East. After ascending to the throne of Jordan upon the 1999 death of his father, King Hussein, King Abdullah has aggressively prodded Islamic leaders toward a uniform message reflecting the moderate beliefs of the vast majority of Muslims, as an antidote to the Islamic extremism associated with terrorism. In 2004, he launched the Amman Message, which brought together 200 Islamic scholars who issued a declaration the following year. The declaration, which recognized the legitimacy of all eight legal schools of Islam, forbid “takfir” (declarations of apostasy) between Muslims, and established when “fatwas” (a legal opinion) could be issued. The declaration has been widely accepted by Islamic scholars and institutions. King Abdullah also has funded the “A Common Word Between Us and You” initiative, which aims to promote understanding between Christian and Muslim communities, and proposed a U.N. World Interfaith Harmony Week aimed at understanding the values of peace in all religions. The proposal was unanimously accepted by the U.N. General Assembly. In addition to this work, King Abdullah also has protected some of the most important religious sites in Jerusalem. The dynasty of which he has been a part has been the custodian of the Temple Mount since 1924, and in 2016 the king used his own money to assist in restoring the Church of the Holy Sepulchre. He also has supported legislation to restore and develop the site of the baptism of Jesus and given various Christians blocks of land to build churches there. “He decided that a prize to single out people who were responsible for, in his words, the ‘marvelous new things going on in religion,’ would help them become more well known, not so much for their own benefit, but for the benefit of people who might be inspired by them,” she added. King Abdullah joins a group of 47 recipients of the Templeton Prize recipients including Mother Teresa, who received the inaugural award in 1973; the Dalai Lama, 2012; Archbishop Desmond Tutu, 2013; and Jean Vanier, founder of L’Arche, 2015. The northwestern corner of Ethiopia bordering with Sudan is a vast low land area with very high temperature up to 50 degree Celsius (122 Fahrenheit!). This vast land surface is occupied by a tribe, the Gumuz people, one of the more than 85 ethnic groups in Ethiopia. These people are traditional worshipers of nature and very honest with their own strong ethical values — they don’t tolerate lies or stealing — but most of them have never encountered the Gospel or Christian teaching. Now, that is beginning to change. The area where they live is part of the vast pastoral territory of the new Bahir Dar-Dessie Eparchy. It a new area for evangelization, with very tough and challenging environment. It was the courageous Comboni Missionary Sisters who first set foot in the area called Mandura in 2000. They rented a house from an Orthodox priest and started visiting people — teaching reading and writing for kids under the shade of a large tree. They also taught hygiene to women and offered some simple advice on agriculture and farming. Slowly, they built rooms for kindergarten lessons. The Gumuz people at that time had no clue about the value of education. When the sisters started school for kids, they had to walk around in the villages to speak to parents and urge them to send their children to school. Following in the footsteps of the sisters, the Comboni Missionary Fathers of the Heart of Jesus started a small mission station in Gilgel Beles in 2003; in 2011, they established an outstation of Gilgel Beles in Gublak. Recently, I had the opportunity to visit Gilgel Beles and Gublak, part of an initiative supported by CNEWA. The Comboni Missionary Fathers are engaged in the pastoral activities in the areas. Most of the growing faithful are young people and women. To support and encourage evangelization in the area, the missionaries have launched a strategy of ongoing training for catechists and coordinators. More than 100 catechists and coordinators were gathered recently in Gilgel Beles for a weekend of ongoing formation. They came from the chapels of Gilgel Beles and Gublak. The training involves a variety of participatory programs. They began the day with a rosary recited while walking around the church compound. Lectures and classes filled the day Saturday, along with the celebration of the Eucharist. People took a break to escape the heat in the afternoon. Sunday included Mass, singing, teaching and a fraternal lunch. What a nice and creatively organized training program had it been! I asked a group of young people to explain to me the difference between a catechist and a coordinator and what each does. They told me that a coordinator is the one who is able to convince people of the village to gather together for catechetical teaching, prayer and spiritual sharing. Once the coordinator does his job of gathering the community, the catechist comes in to teach catechumens — preparing them to receive sacraments — and leading the community in prayer and Bible sharing. I was amazed by how well the priests coordinated these activities. Father Isaiah, a Comboni Missionary from Kenya and a dynamic parish priest of Gublak, told me that villagers appreciate the regular visits of priests and sisters. Whenever a priest visits them in the villages and chats with them, they believe that he brings them good luck. What an amazing belief! As a result of such enthusiastic and committed engagements of the missionaries — and their collaborative catechists and coordinators — Christian communities in the area are growing slowly but steadily. According to the recent figures, there are about 1,500 Catholics in Pawe, 1,500 in Gilgel Beles and Mandura, 1,000 in Gublak, 500 in Dibati. This makes a total of about 4,500 Catholic faithful in the area. The number of new catechumens is increasing, thanks to committed catechists and coordinators who accompany the dedicated missionary priests. CNEWA, through its generous donors, participates in this precious evangelization mission of the church in this remote part of Ethiopia. In 2018, CNEWA committed to support formation training for youth leaders and catechists in Gilgel Beles and Gublak. How wonderful and rewarding it is to see the light of the Gospel being shared with these marginalized people! With your support, we are able to make this happen. Thank you!